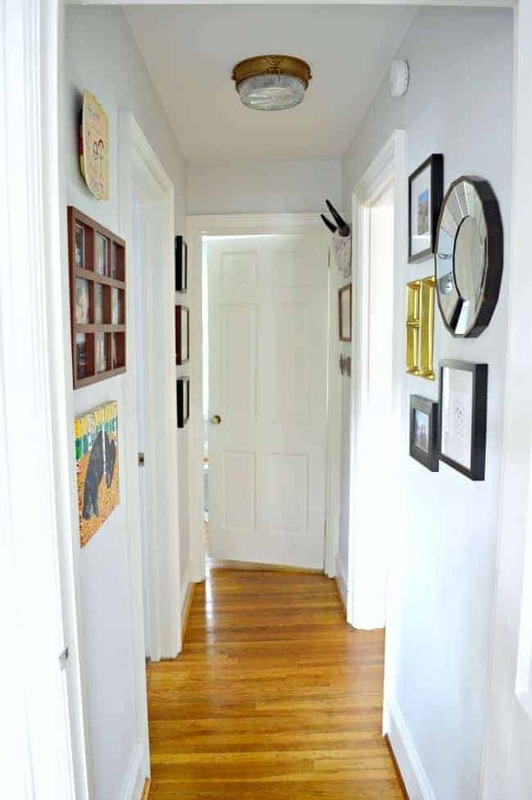 I’m not sure if I’m more excited about spending less than $50 for our hallway redo or the fact that I’ve completed the first space in our new house, but it’s definitely a happy day here. 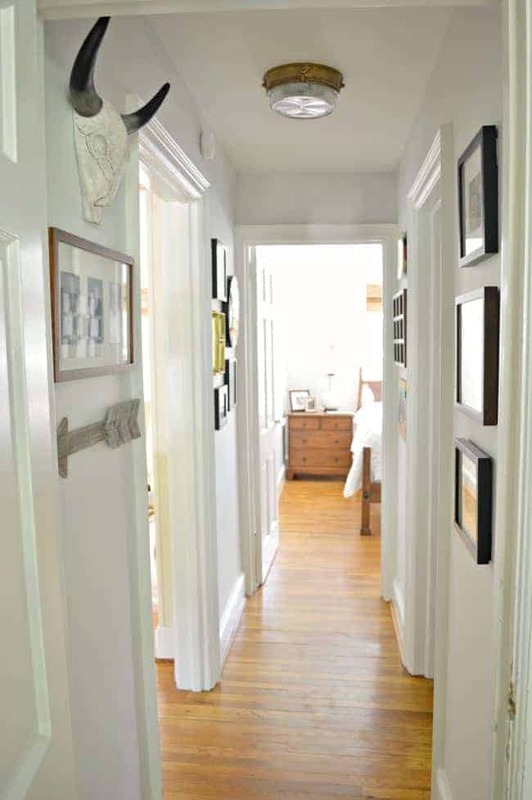 I didn’t think I would be able to do anything until my feet were completely healed but this little hallway redo was easy and it was enough of a change that it satisfied my need to redo a room…for the moment anyway. Throw in the fact that it didn’t break the bank and you have the perfect project (and one happy hubs, because he’s always thrilled when a project doesn’t cost a lot). This is looking toward the master bedroom, with the bathroom on the right and the living room and dining room to the left. Most of the house was painted with SW Navajo White and it looks yellow in almost every room, which isn’t bad but it’s really not my style. Looking from the master to the guest bedroom. There were a couple of huge holes in the walls from a smoke detector that was mounted in the middle of the wall (who does that?) and an old alarm system that didn’t work, so they were removed and the walls were patched. We, and when I say “we” I mean me, also wanted to change the vintage ceiling light for something bigger that would light up this dim space. The ceiling and trim were painted by the previous owners right before they put the house on the market in May, so I didn’t need to touch them. Once the walls were prepped, it was time for the good stuff…paint. 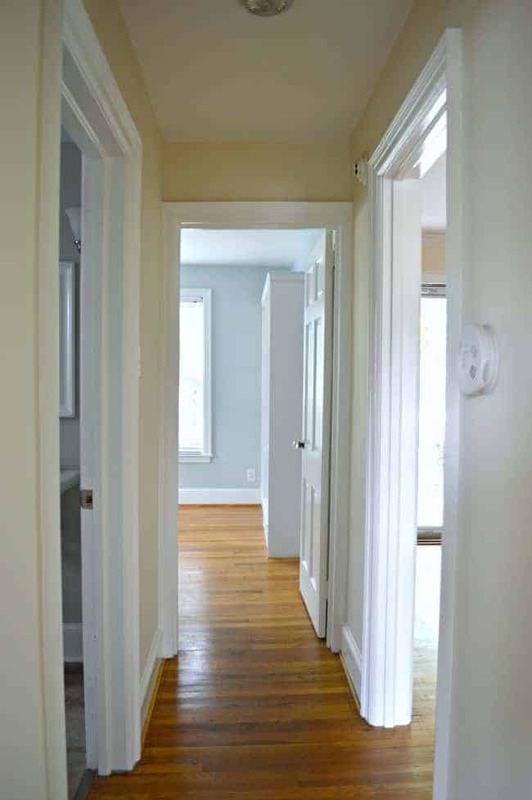 I stuck with a light gray for this space and chose Benjamin Moore Horizon, a beautiful gray/blue. It was my first time using this color and I love how it turned out. I hung family photos in the hallway in our last house in Illinois and knew that I would probably do it here as well. This is really the only space in the house where I can put all of my favorites together. It’s my happy space filled with great memories of our girls. Looking from the master to the very messy guest bedroom. We removed the old light and put up the brass fixture that I had in my entryway in our last house. It was a great find from ReStore and I snagged it for $20. 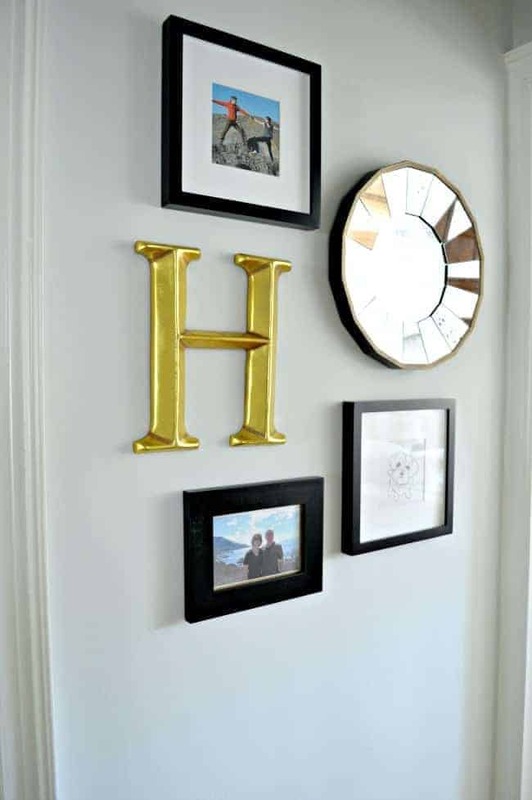 I’m adding some brass touches to the bathroom so I thought that repeating it in the hallway would tie the two spaces together. I was slightly nervous about hanging so much in this small space but I really love it. I switched some of the photos and frames around but everything I used I already had. The only purchase was the paint, and I have half of it left to do another space. Just finishing this space, and having family photos out so that we can see them every day, has really made our new house feel like home. I’m excited to start the next project. What’s new with you? Have you finished any projects lately? 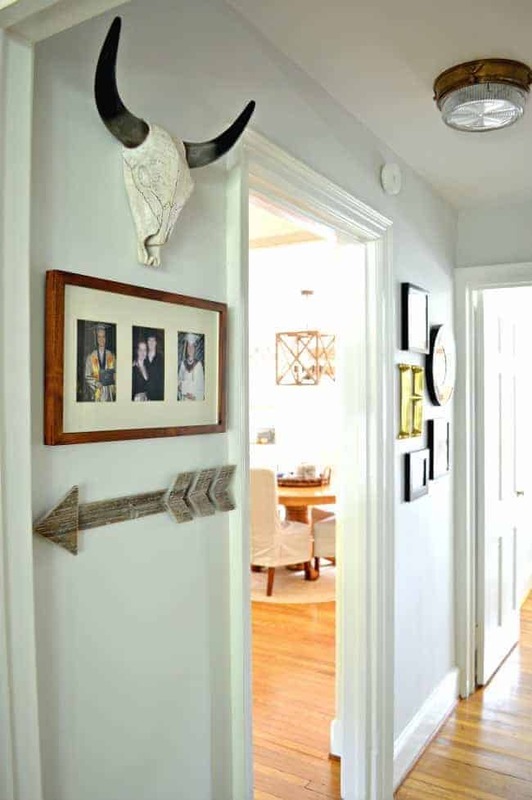 Looking for hallway decorating ideas and inspiration? Check out this post. Wow! It looks amazing! 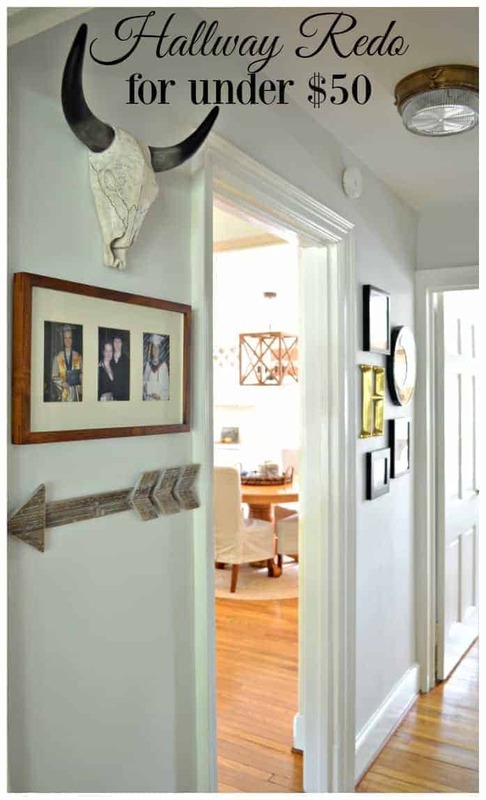 You definitely have to have an eye to make groupings look good and you have it! Thanks for sharing at Throwback Thursday! I really love your hallway!!! Very creative and unique!!!! Thanks Christine! I’m really happy with the way it turned out. So much fresher! And talk about a blank slate! Thanks for sharing this at Throwback Thursday this week. Thanks so much, Mollie. Sorry for the late reply, your comment went to spam. I appreciate you stopping in. Your home is so adorable. I love Hobby Lobby for accessories so it makes it possible for people on a budget to actually decorate. Thanks Kari! I totally agree with you about Hobby Lobby. It’s a great resource for decorating and the prices are awesome. Super cute ideas! I love the decor you chose and it looks like you spent more than $50! 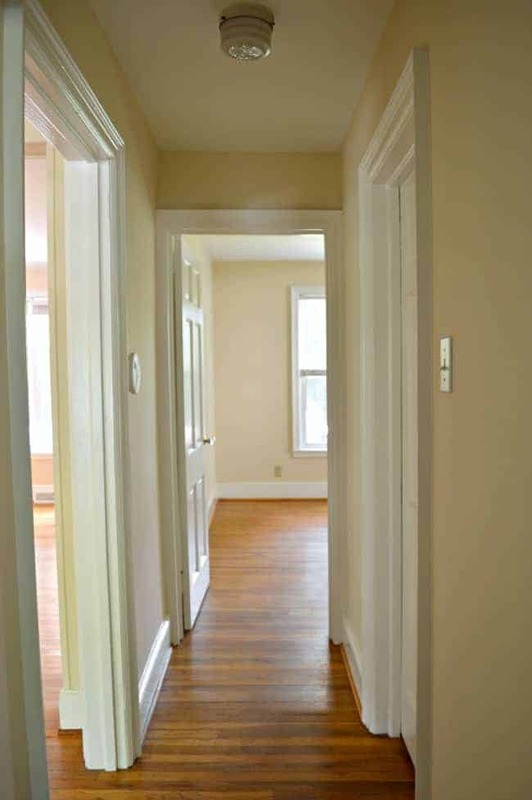 I love the wall color you chose and this gives me some ideas for our similar small hallway. Thanks so much, Mary. I’m really happy with the way the hallway turned out. I was afraid that it would be to dark but it turned out to be the perfect color for the space. You did great. I think its a perfect amount of decoration! Thank you, Gabrielle. I’m thrilled with the way the hallway turned out. 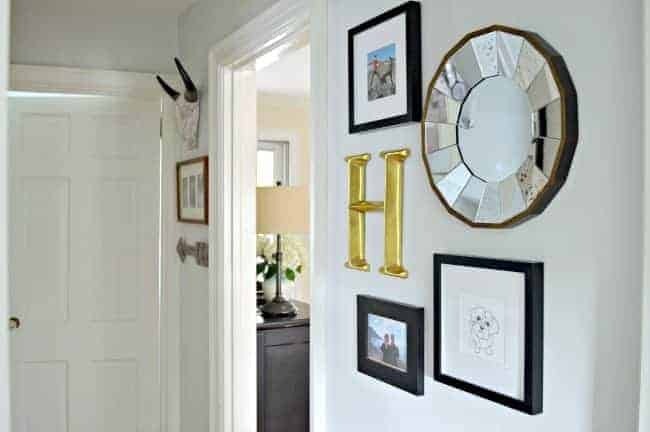 Your hallway decor looks great! I think you did a wonderful job with the placement of the various elements. Thanks for sharing at Snickerdoodle. Pinning. I love it, it’s very cozy looking… I bet you find yourself just standing in the hallway lately huh?! ha ha! I love the paint color and the light fixture. You gave the space such a nice feel and personality. Gorgeous, love what you did with the hallway. Thanks for sharing. Oh, looks great. What a nice gallery that makes. You haven’t lost your touch! Are you planning on using a carpet runner? Have a good week. Awww, you’re comments always make my day Brenda. I’m still on the fence with a carpet runner, the hubs isn’t a fan. If I find something I love I may sneak it in there. 😉 Hope your week is great. Awww, thanks so much Kim! It’s great to be home. You’ve done it and done it very well. I love the blue grey chosen and the idea of hanging favorite photos. That’s so sweet, thanks very much! I love the results. I love it! The wall color is beautiful. I love the light fixture, too. I don’t think you put too much on the walls–it looks great!